Party With a Purpose - Yelp Helps Support Local Atlanta Nonprofits! Yelp Helps is coming to Atlanta for the first time and all of Yelpland is invited! 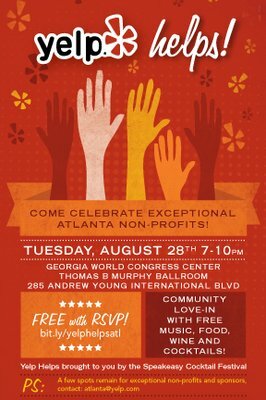 This FREE event will celebrate some of Atlanta's fantastic non-profits and their mission to make the world a better place. Please read the RSVP information carefully: Advance RSVP is required for admission. 1. Log in to Yelp. 2. Click the "RSVP" button to your right. 3. Enter the full name of your guest. 4. Tell your friends! This event is open to all, and we want the whole city to be there. 5. Confirmations will be sent 48-72 hours in advance. Now, for all the details! This event is 21+ only, and proper identification is required. There is a suggested donation of $10: all door proceeds will be split evenly amongst the participating non-profits. They'll also be collecting socks and underwear (all ages and genders) at the door for RRISA.